You are invited to attend a screening of a powerful film, Speechless. This one-hour documentary shows three stroke survivors struggling to regain their life after the loss of communication skills. Through their story we witness a quest for happiness and the real meaning of human communication. The film will be followed by discussion with an expert panel of specialists. Saturday, June 23, 10 am – 12 pm, at the Hale Activity Center in Dunedin, OR June 30, 10 am – 12 pm, at the Sunshine Center in St Petersburg. 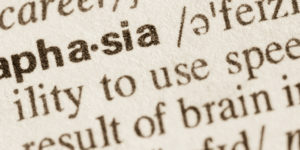 June is National Aphasia Awareness Month. About 40% of people who have a stroke have difficulty communicating, a health condition called aphasia. Learn more about what happens and what you can do to help at this event that is free and open to the public.